Imagine being given $10k a month to spend on advertising for your charity. How much of a difference could that make to your cause? That’s exactly what the Google Ad Grants program does. Google for Nonprofits provides up to $10k of in-kind advertising to nonprofits through the Google Ad Grants Program. Once you’ve qualified, you’re able to set up your AdWords account. Through AdWords, you’re able to run ads on Google search results. 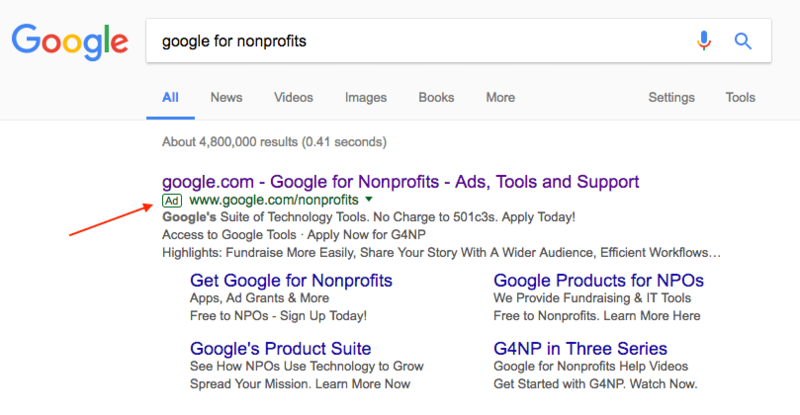 Like shown below, these ads show up when users search Google for nonprofits like yours. The extra exposure can help raise awareness for your cause, increase the number of donations, and spread your message across the globe. To be eligible, you must become a part of Google for Nonprofits, hold a valid charity status, agree to Google’s T&C, and have a live website. Staying eligible takes a little bit of work as you’ll need to log into the account once a month and make at least one change every 90 days. 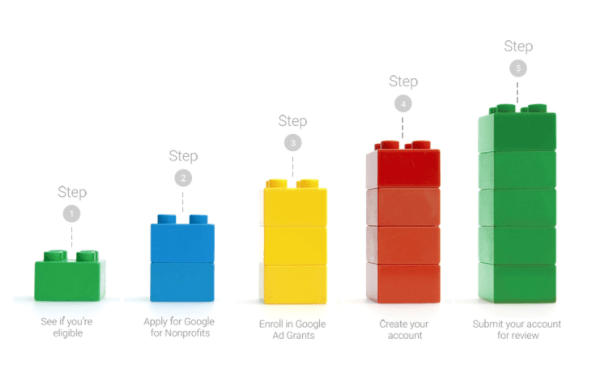 You can absolutely get set up with the Google Ad Grants program on your own, but PINT can guide you through the process to help you make the most of your account. PINT will complete a discovery effort to determine the appropriate keywords for your campaigns, as well as configure your AdWords account. Once the appropriate keywords are determined, PINT will organize ad groups and campaigns based on keywords, landing pages, and location targeting. Next, the ads and ad extensions are crucial to conversions. We can also provide ongoing maintenance to ensure that you stay eligible for the program, are optimizing your ads, ad groups, and extensions. The other crucial piece of your AdWords campaigns is the landing pages and website to which you’re directing traffic. Having a mobile-optimized site will not only help your click-through rates but will also help you rank higher organically. Creating content-driven landing pages will help your audience find the right information as soon as they land on your site. The next step is optimizing for conversions. To do this, add analytics tools and monitoring software to see how users interact with your site. Once this is in place, we can add event tracking and goals to see how well the pages are performing. Also, using real user monitoring can show us the actions users are taking on the site and where they run into issues. If you would like help getting set up with Google Ad Grants or managing your AdWords, let us know. We can help you get your account in shape.